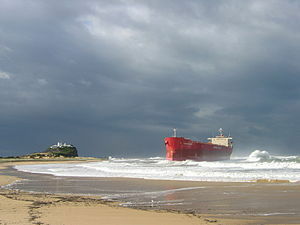 Nobbys Beach was made famous the world over by the running aground of the Pasha Bulker during violent storms in June 2007. But that's not what Novocastrians associate Nobbys Beach with. For the locals it's the beach they've grown up visiting weekend after weekend through the summer. And for good reason. It has a postcard picture perfect view from almost any angle. There is a great walk up to the lighthouse which was originally established in 1854, the break attracts surfers from right around the area (and this is made easy by its close proximity to Newcastle train station), and whenever the wind picks up, the kite surfers make good use of the conditions. There is also a popular walk along the port channel from the beach to Queens Wharf. This is a popular strip of cafés and restaurants along the waterfront. From here you can also catch the ferry across the channel to Stockton. For fun things to do at Stockton click here . 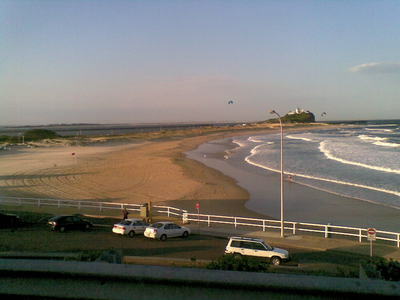 During school holidays, the beach reserve hosts amusement rides and stalls and on Sunday nights the car park is always popular for the car enthusiasts. Newcastle has several beautiful beaches but none more centrally located and picture perfect than Nobbys Beach. Why? For a postcard picture perfect view from almost any angle.